Historical analysis reveals that perceptual theories and models are doomed to relatively short lives. The most popular contemporary theories in perceptual science do not have as wide an acceptance among researchers as do some of those in other sciences. 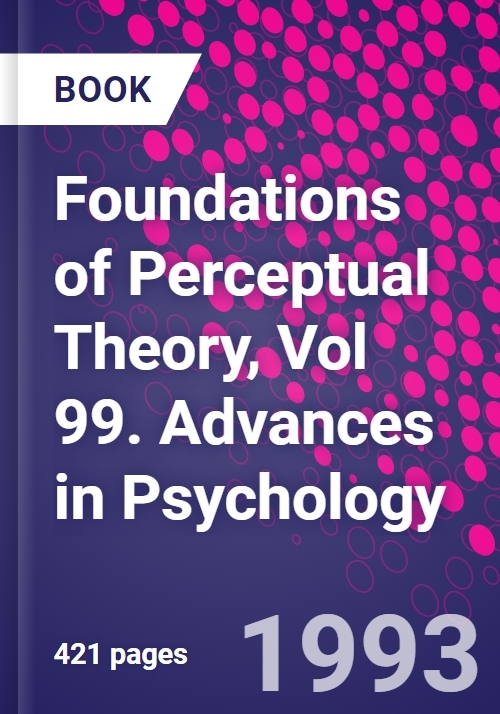 To understand these difficulties, the authors of the present volume explore the conceptual and philosophical foundations of perceptual science. Based on logical analyses of various problems, theories, and models, they offer a number of reasons for the current weakness of perceptual explanations. New theoretical approaches are also proposed. At the end of each chapter, dicussants contribute to the conclusions by critically examining the authors' ideas and analyses. Preface. List of Authors. List of Discussants. Toward a new behaviorism (W.R. Uttal). Some philosophical observations on perceptual science (S.C. Masin). A hierarchical approach to perception (D.R. Proffitt). The analysis of perceived space (W.C. Gogel). On some paradoxes of current perceptual theories (P. Bozzi). On experimental phenomenology (G.B. Vicario). The inside-outside problem and Wolfgang Köhler (N. Pastore). Perceptual artifacts and phenomena: Gibson's role in the 20th century (J.E. Cutting). The role of computational complexity in perceptual theory (J.K. Tsotsos). On the need for a general quantitative theory of pattern similarity (J.T. Townsend, R.D. Thomas). Perceptual variability as a fundamental axiom of perceptual science (F.G. Ashby, W.W. Lee). Author index. Subject index.